Windows Server 2008 breaks down the additional Windows components into roles and features. Depending on the Exchange 2010 roles, Windows Server 2008 will require additional Windows Server roles and features to be installed. 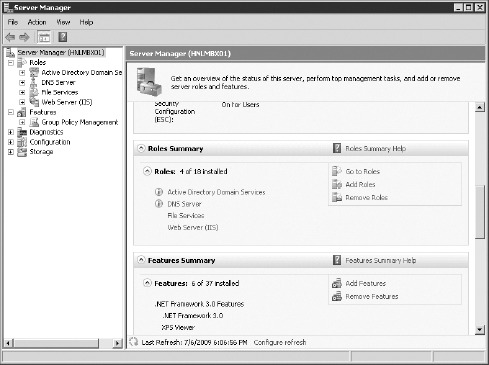 These can be installed using the Windows 2008 Server Manager console, as shown in Figure 2. Installing the server roles and features required is pretty easy to do using the Server Manager interface, but installing them is even easier using the ServerManagerCmd.exe command-line utility. You can use ServerManagerCmd with the -Query option to see which roles are already installed (see Figure 3), or you can use ServerManagerCmd -Install to install additional roles if you know the short name of the role or feature. Table 1 shows the roles and features that are installed for the Exchange server roles. You should install the required roles in the order found in the table. The ServerManagerCmd.exe program is smart enough that if you select a role that has prerequisites or additional features, it will install the required software. 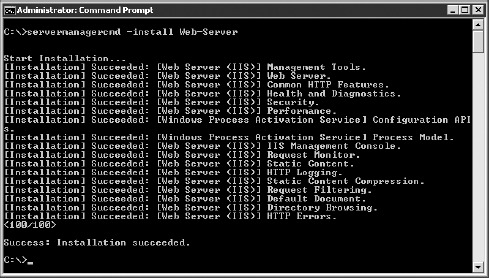 For example, in Figure 4 we are installing the Web Server role; notice that the required functions are automatically installed. Download or install via Microsoft Update the .NET Framework v3.5 Service Pack. Download and install the Office 2007 System Converter filter pack. Run ServerManagerCmd -Install RSAT-ADDS and then reboot. Download or install via Microsoft Update the .NET Framework v3.5 Service Pack 1. Download or install via Microsoft Update the .NET Framework v3.5 Service Pack. 1. Download and install the Windows PowerShell v2. Download and install Windows Remote Management v2. 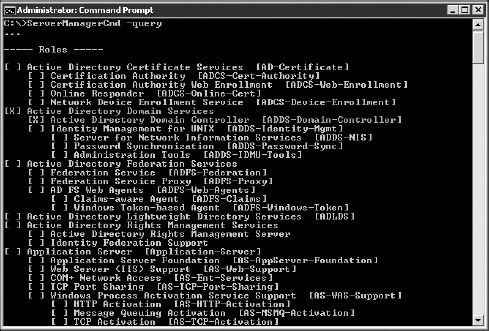 Add Active Directory Lightweight Directory Service (AD LDS) feature using this command: ServerManagercmd -I ADLDS.